And yes. This is a 100% vector. I downloaded Inkscape and I thought I should try to do real vector. You know what, vectoe artists? I salute you. Seriously guys, it's so many work, that I don't know how you do it all the time. You guys are awesome. About the vector. Probably you ask, why Blossomforth. 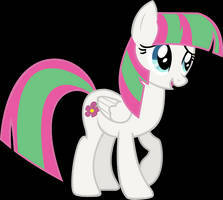 Well, not just because I love Blossom and her design, but also because there isn't much Blossom vector. Only 2, I think. Of course it's logical as the poor girl only appered that much in Hurricane Fluttershy. HOWEVER, there was another pony (who probably has a name, as I know this fandom, but I don't it), who has the same design as Blossom just with differnt colors and cutie mark. So...well I think you know what did I do. Feel free to use this vector if you want to. You don't need to give credit, but it would be nice. What is a vector? Sorry, I sound dumb. How do you make a vector too? I don't really know what a vector is either. How are you and Cato going? And for a first time try, this is good, damn good! You are just too much -ing AWESOME! Is it possible for you to provide the SVG file? I'm trying to get better at vectoring, and some exemplars would be nice. Thanks! However, I'm also a newcomer in vectoring, so it's kinda messy and hard to follow.^^' But I hope it helps someway or another. Great looking Blossomforth. I really like her design for whatever reason. I hope we get to see more of this flexible mare in the show. Nice job on the vector.